This is the first of our new Mixed Media style challenges. We would love if you think a little outside the box for this challenge, and whilst each of these challenges have a theme - this one is Winter or Slap It On (please see below for full definition) they are also 'NO CARD' challenges, or at least this first one is. The term 'Mixed Media' is a broad spectrum term covering many aspects of arts and crafts, it can include altering objects - books, boxes, frames, furniture - art journalling and book making and collage, and many more I can't think of right now! The items used in the creation of a mixed media piece are plentiful, and can include, buttons, broken jewellery pieces, all sorts of things that other people throw away and consider to be rubbish, paint in all forms, texture pastes, both proprietary and if you want to save money, home made from glue and talc, scraps of metal, fibres, filaments, chipboard, old photos to add or alter, pens, pencils, markers, crayons, chalks, polymer clays etc. etc. etc. Yvonne has very bravely offered to host the first of these challenges, and she has come up with a nice loose theme for the first one. She would like to see something either related to Winter or Slap It On INVOLVING MIXED MEDIA, which basically means that anything goes, as long as it's mixed media. So if you cannot think of or don't want to make something Winter related then any other theme is fine by us. As you can see a lot of the team took literally to 'slap it on' and you can too, but you don't have to add everything but the kitchen sink to qualify! We would love to see your album covers, canvases, altered art, upcyled, recycled, re-purposed or even brand new from scratch projects, but please we do not want to see cards in this one. Maybe you have an old coffee tin you want to give a makeover too, or you have found something fabulous in the charity shop and you have given it a new lease of life, or a new purpose. We know it seems a little odd to be asking for Winter projects so late in the season, but we are not quite in Spring, and perhaps you want to celebrate the fact that Winter is on it's way out, or you can of course go down the 'slap it on' route instead. 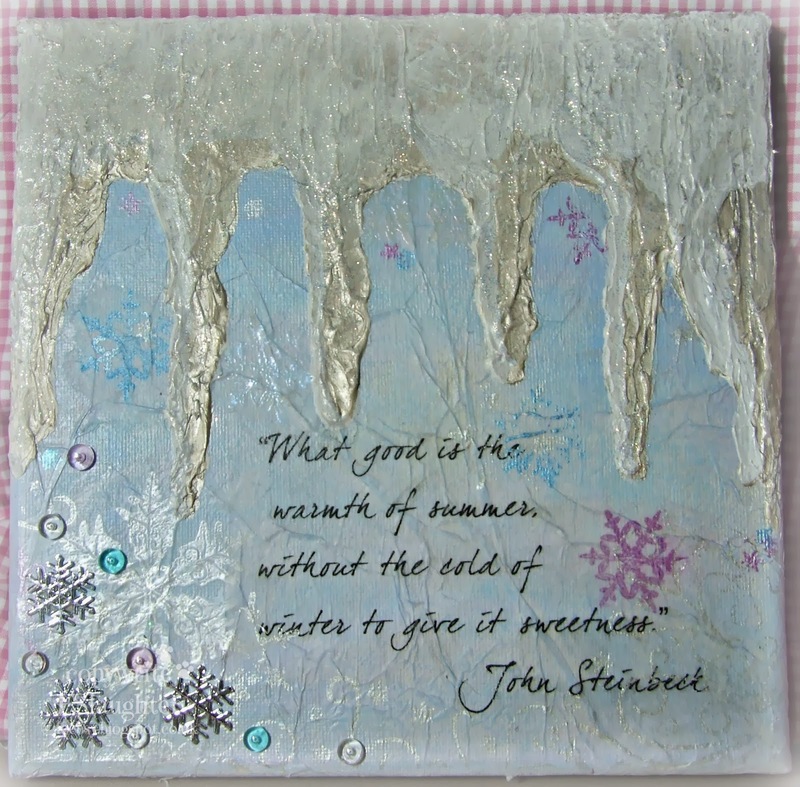 As this is a broad theme choice, I have chosen to use winter colours, blues and whites with a touch of snow and frost [glitter] on this canvas.. The background, lives up to the slap it on mode, with layers of paint and stenciled texture. Well winter isn't inspiring me at the mo, I'm longing for Spring so I've gone with Slap It On adding papers, paints, texture paste, die cuts and metallic rub ons to this transform this papier mache box. The original color on this box is red, but I forgot to make photo.I colored her with few layers white paint, after that few layers light brown paint and used dark distress.After all this I removed some places from last layers and finally the result is this old vintage effect. 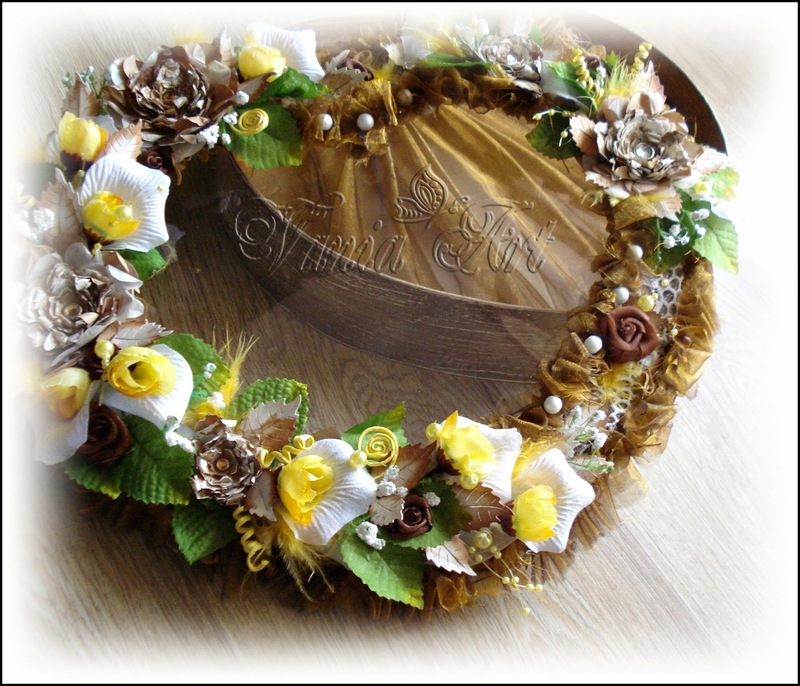 For the box cover I used a lot things...lace, handmade flowers, leaf from paper, pearls, roses , yellow feathers and so on. When everything was ready I painted some places from flowers and leafs with white paint. 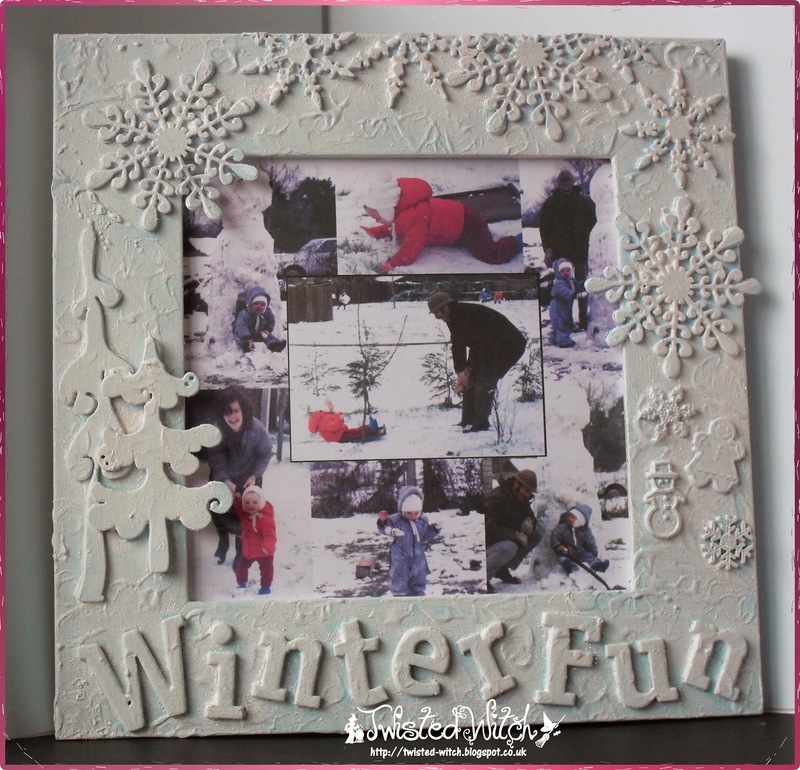 I have made a Winter themed photo frame from an old frame liberated from my local refuse recycling centre, or commonly know as the Tip! My piece has a lot of mixed media.I used paper, fabric, lace, paint, snow tex, coloured PVA, multi medium, texture paste which I mixed with micro beads, also texture paste to make the clouds and trees which was done through a stencil to make the embellishments and all of it was highlighted with wax. I am sure some of the team will have step by step photos on their personal blogs so please drop by and give them some love. Great inspirations of the DT! Thank you Lin for you sweet comment and also for letting me know I had my picture entirely too big and it was half hidden. I have changed it so now you can see the whole thing.